As an MBA, I was taught that employees should always be treated with the utmost respect, and that a corporation should never involve themselves into employees personal lives, especially super-personal things like sexual preference, lifestyle, religion and most of all, charitable giving. Charitable giving is a very personal matter which has no business in the workplace. It?s not ethical for any corporation to sponsor or endorse any charity, especially those where millions of dollars are used for administrative and advertising expenses and where some charities are offensive to employee?s moral or religious standards. Many corporate managers cite the yearly United Way shakedown as an example of corporate misfeasance, where employees are openly coerced into giving ?their fair share?, suggesting that you are being unfair by not helping. An example of inappropriate sponsorship In my experience I?ve had open coercion with statements from my boss like ?For the past 30 years, 100% of our employees have given their fair share?, subtly suggesting that if I did not give, I might not be an employee next year. This type of exposure of employees charitable giving is completely inappropriate for any workplace, and it's especially egregious when the employer gives-out awards and special recognition to those who contribute large amounts.
? [The charity] uses coercion, guilt, public humiliation and pressure to extract money from donors. They are not asking people to give, they command donations. . . They make you feel guilty of not donating money by harassing you every day to return the form. They ask (force?) the employer to draw a price for all who return their forms, whether they donate or not.? 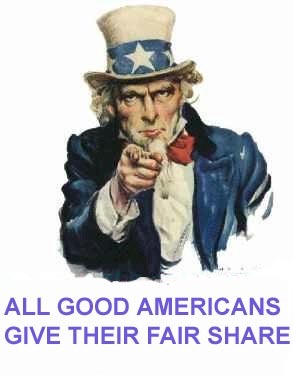 Also, the "fair share" suggested by corporate sponsored charities are not trivial, and the United Way ?Fair Share? can amount to thousands of dollars. ?His manager reviewed his United Way contributions. If the donation didn?t meet ?company contribution goals? my friend was bluntly told to raise his ?level of giving?. And when the people who sign your paycheck tell you to give to charity, you pony up.? Employee coercion is unethical Many employees detest the corporate ?requirement? whereby all employees are required to sign a document stating that they are not giving their fair share. Many employees who detest employer sponsored charities will donate money because of these veiled threats, but there are many other ethical, moral and religious reasons not to give to institutional charities. According to Charity Reports, the top management of United Way earns over a million dollars a year. For another example, the United Way reported a $1.5-million pension payment to its former chief executive, Ms. Beene, when she departed after only four years on the job. In 2006, it was reported that the CEO of United Way used $190,000 worth of points redeemable for hotel stays that had been originally donated for charitable purposes. Do you really want your hard-earned money to pay for this? Employee Objections - Many employees have moral objections to specific charities of large charities, specifically those dealing with abortion, birth control and other controversial social issues. High Overhead - Corporate sponsored charities can spend millions of dollars in donated funds for advertising. For example, in 2006 the United Way spent more than $60 million dollars of ?fair share? monies in administrative expenses. ?Sorry, but I just can't get excited about it and I feel I am being harassed. Only one week into the campaign and I have received over a dozen emails and about half a dozen long voicemails about it. The voicemails are what really, really annoy the crap out of me.? In sum, any respectable corporation should respect the rights of their employees and never, ever, endorse any charity. However, it's not inappropriate to notify employees about any worthy charities, so long as they are low-overhead, non-religious and effective, organizations like like www.heifer.org which gives livestock to starving families. ?The United Way Scandal: An Insider's Account of What Went Wrong and Why? "Don Burleson's personal views on charitable giving"
I enjoyed your article about inappropriate sponsorships of charities. I feel the same way but have to "play along" as well. You may find these articles interesting.